For the first time in years, the S&P 500, Nasdaq, DJIA are all showing negative returns for the year. These are days in which systems have the opportunity to thrive. But just like investors sometimes have confidence in their decision making skills timing how the market is going to perform, many systematic traders believe the same about timing systems. Because systematic traders can be both long and short positions in the markets, these days with substantial loses offer a unique opportunity. While past performance is not necessarily indicative of future results, these kinds of trading days where the markets close at the highs or lows of the day tend to offer an increased opportunity for Trading Systems to engage the markets they follow. So what if a systematic trader missed a day like today? 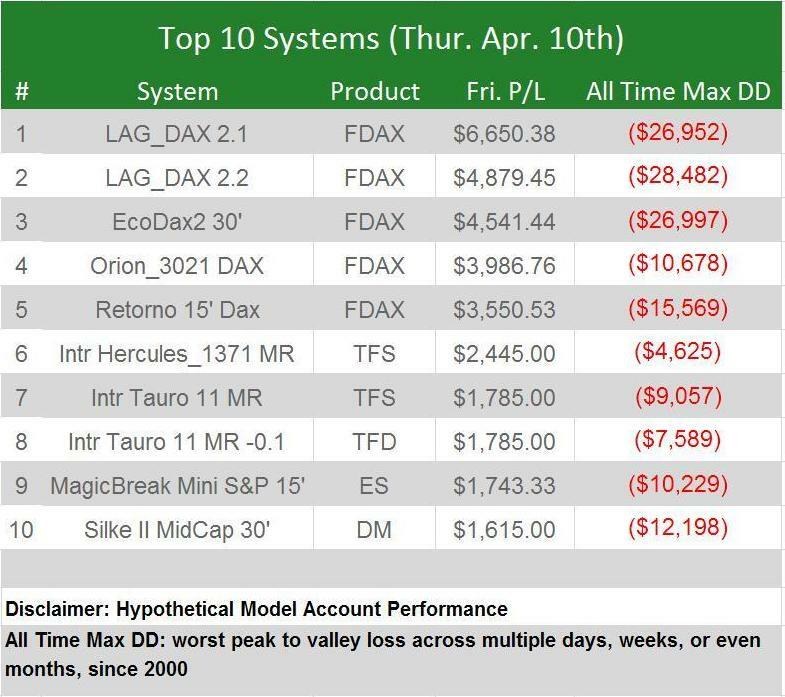 Here were the Top 10 Systems on the AutomatedTrading.com platform Thursday, April 10th, 2014.